John Nash: A Beautiful Mind mathematician killed in New Jersey car crash. 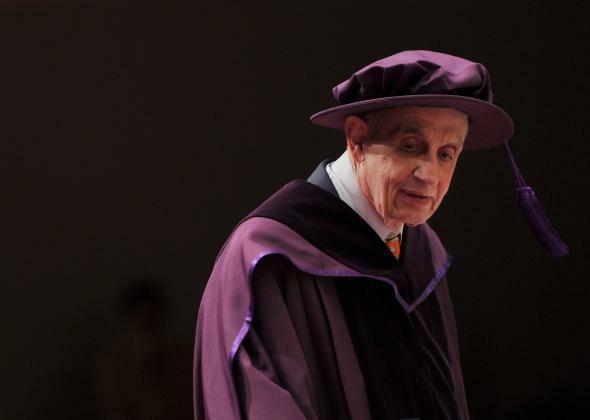 Princeton University mathematician and Nobel Prize winner John Nash was killed when the taxi he was riding in on Saturday crashed into a guard rail on the New Jersey Turnpike. His wife of nearly 60 years, Alicia Nash, was also killed in the crash. John and Alicia Nash were traveling southbound on the Turnpike when their taxi driver lost control as he tried to pass a car that was in the center lane, leading to the crash, reports NJ.com. A law enforcement officer said the Nashes likely weren’t wearing seatbelts because they were both ejected from the car when it crashed. The taxi driver, however, was taken to hospital with non-life-threatening injuries. By the time Dr. Nash emerged from his disturbed state, his ideas had influenced economics, foreign affairs, politics, biology—virtually every sphere of life fueled by competition. But he been absent from professional life for so long that some scholars assumed he was dead. Although already well-known, Nash became an international celebrity when his life story, including his struggles with paranoid schizophrenia, were portrayed by Russell Crowe in the 2001 film “A Beautiful Mind,” which won four Oscars including Best Picture. “Stunned…my heart goes out to John & Alicia & family. An amazing partnership. Beautiful minds, beautiful hearts,” Crowe posted on Twitter today.